ABA’s Veteran Oak Quarter scheme at the North West Cambridge Development was published in Building Design, after the scheme was awarded with planning permission. 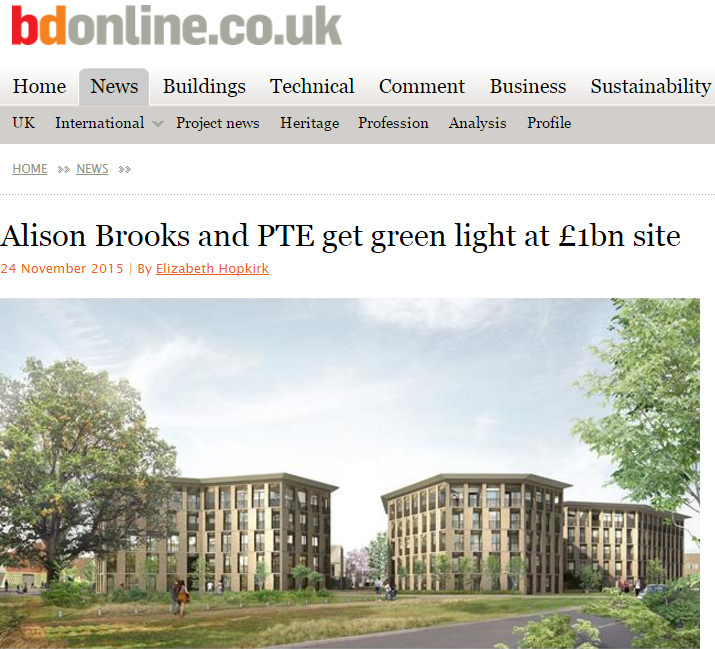 “Alison Brooks and Pollard Thomas Edwards (PTE) have won planning for housing at the £1 billion North West Cambridge development. “The first phase of market housing at the Cambridge University-promoted urban extension will provide 240 new homes set along streets and around public spaces. “The scheme, to be built by Hill, includes apartments, townhouses and detached family homes and is designed to be a sustainable urban neighbourhood. “They will have “generous” front halls and ceiling heights, plus large living areas and spaces for home working. The homes will be designed to level 5 of the Code for Sustainable Homes. “The North West Cambridge Development is the largest single capital project the university has undertaken in its 800-year history. Outline planning was granted in February 2013 for the 150ha site between Huntingdon Road, Madingley Road and the M11. The masterplan includes 3,000 homes. “Other architects working on it include Stanton Williams, Cottrell & Vermeulen, the AOC, Proctor & Matthews and Sarah Wigglesworth.